So here is the cleaned corpse of the rooster- many thanks to Spice, who in spite of having presided at quite a few mammal cleanings, was a little squeamish about cleaning a bird. As you can see; it's a pristine carcass. Spice opted to just chop the wings, since a major part of the trickiness here was preventing a rather dirty exterior from coming in contact with the clean meat; it was just too fussy for too little reward, in this case. It was all a great success. We simmered the bird for a half day or so, on the back of the wood stove, to the point where it was fork-tender and falling off the bones. It smelled wonderful. We moved the bird off the heat, covered, to wait for evening, when we'd add the veggies. And then we got interrupted again. Spice and Smidgen went out to the greenhouse to do daily chores- and found Smidgen's pet bunny, which she named Horton, when she was 2annahaf, after the Suessian elephant, dead in his hutch. Old age, in this case- he was given to us when he was 6ish, several years ago. Farm kids learn about death, and life, immediately. So it wasn't the earthshaking trauma it can be for kids who've been insulated; but still, no fun, and right on the heels of the death of the rooster, whom she also knew personally. No, we didn't eat the pet rabbit! sheesh. But things had to stop for a while, and a funeral and burial arranged. Secure burial, so dogs and coyotes wouldn't dig it up, we hope. Though the ground is still frozen, a foot down- so it was tricky. Then as part of the consoling process, another, longer, interruption was launched. Smidgen announced at the noon meal that she was going to get another rabbit. A very positive little girl. Mummy and Daddy were not enthusiastic about this, however, since the bunny was pretty much a dead drag on resources and space, and we really didn't have a sensible place for it to fit in. So by way of distraction, I reminded Smidge of our intention to get another puppy; fairly soon. And I tried to convince her that having a little fuzzy puppy to hold would be at least as good as a rabbit; and maybe better. She was a little wary of the idea, but the campaign for a new bunny went quiet. Now that the topic of the puppy was open, however, Spice asked if she should go ahead and call the shelter lady- right now, while we were thinking about it. Since it's spring(ish) and we were going to be pretty specific this time about what kind of puppy we were willing to accept, I figured we'd be looking at a 1-2 month wait, for the right pup to be located and transferred, etc. So, I said; sure, go ahead. I'm not sure if this was a good bit of karma, or bad- but the shelter lady called back immediately, with the news that in fact, she had exactly the puppy we were looking for, right now today- and - she was leaving for two weeks (shelter convention and break time) - in two hours. So- NOW is when we needed to take the pup. This is Theodore; a half Anatolian Shepherd, half - Collie? Aussie? cross; #10 out of 11 pups in the litter; just weaned, the only black one, and the biggest. 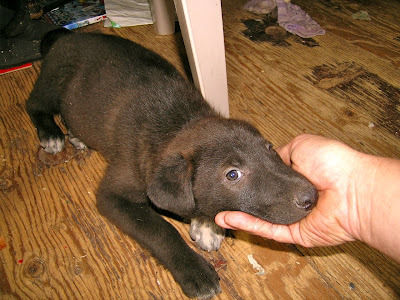 (No plott hound involved, in spite of the post title...) The shelter lady leans toward the Aussie for a father, because of the black color. But we don't really know. The time spent in getting the puppy from the shelter, and cuddling him through his introduction to our family, including Delilah, who still sleeps in the house, and is not a puppy (sizewise) anymore- kind of made it impossible to finish off the chicken pot pie and actually pay attention to it, or appreciate it. Our plot had thickened; just a bit too far. How this pup came to be; and came to be available, is a story of the deepening depression. His mother is a purebred, registered Anatolian- with a chip in her ear. The chip identifies her unequivocally, of course- so how is it such a valuable dog was found abandoned, injured (missing several toes), skinny, and pregnant? She had been owned by a couple in Iowa who were running a poultry business, in fact. Which went bankrupt. And the owners- just disappeared; leaving everything behind. The shelter lady says most shelters are full these days- the number of dogs being abandoned is way up. Part of the reason for the conference she's attending- they're trying to figure out how to cope. So, meanwhile, we're back to puppy pee and puppy poop all over the place. Theodore is not yet paper trained, alas. Plus, Delilah is frequently explosively ecstatic to have a buddy to chase and chew on- you do remember that The Little House is 15' x 20' downstairs? With a sink, woodstove, dining table, bookshelves, desk, and two window seat thingies? We have our own full scale demonstration of entropic doom now. Sigh. At any rate, Theodore looks like a winner, so far. Very cuddly; already comes when called, has no trouble holding his own in the rough and tumble with the much bigger dog- in fact when they get to the play-growling point- his growl is the most impressive. He's definitely serving his purpose of wearing out and calming down Delilah. And seems to have good common sense. We've been paying our shelter fees with barter, incidentally; the shelter lady has been happy to do it that way. Otherwise, it's $100 minimum, and likely more, depending. Back to the chicken pot pie! We put it off until the next evening, then took off from a mixture of Joy of Cooking and Farmer's Daughter's (thanks!) recipes; added onion, carrots, and potatoes, a little thyme, salt and pepper, made gravy with some of the cooking liquid, which was then stirred into the whole; and finished it off with baked biscuit on top. Alas, no photo- we were too hungry at that point to remember. But it was wonderful. The chicken, by now, was just a bit overcooked. It was falling into fibers, rather than hanging together in tender chunks. And it was just a tad on the bland side, as it came out of the oven; I think we'll spice it a little more next time; and the rooster was not quite as flavorful as I'd hoped- actually a bit young for this treatment perhaps. In any case, a great success. We got 3 suppers out of it; two with biscuits, and the third time out it was starting to look really cooked by now from all the re-heatings; so we took it out of the pot and fried it in a little butter, hash style. Oh, yeah. Many thanks for all the chicken info and advice, folks. It helped! We're eating it. While I would certainly not eat a chicken I found dead somewhere if I was uncertain about the cause of its demise- my 99.99% was not lightly arrived at. The other rooster killed this bird- to go through the entire diagnostic procedure would be boring- but it was plenty long. And borne out by the autopsy- the carcass was flawless- except for peck wounds to the head- not a bruise on it. There was even some fat (not much) which I was glad to see. No trace of any gut taint smell once cleaned and rinsed. One thing worried me at first, until I realized what I was looking at- the legs and thighs almost looked like they were bruised to me. But- it's just that the dark meat on this bird is really dark. Looking closer it really didn't look like bruising; the dark color was totally uniform. Half the time these days, when you eat chicken thighs, the color is barely darker than breast meat. It's a substantial bird; and is being made into a pot-pie sort of thing; which does involve boiling it until the meat falls off the bones. And while simmering- it smells VERY chickeny. We're going to add potatoes; make gravy; add carrots, peas; and simmer until done; then on the recommendation of my old Joy of Cooking, put biscuit dough on top and bake it. They caution strongly about the hazards of soggy crusts in pot pies- and I'm thinking we'll put trying that off to another day. And, I'm delighted for the advice on rooster numbers; I am a first time chicken herder, in spite of all the school; and I hadn't seen that info elsewhere. We'll wait until we've got a bigger flock to try adding another. We'll let you know how it tastes. Smells wonderful, simmering on the back of the woodstove. Do you remember the extra verses to "She'll be comin' round the mountain"? Do they still sing them, or is it not pc, any more? "We will kill the old red rooster, when she comes." And, "Oh, we'll all have chicken an' dumplins, when she comes." Tradition. 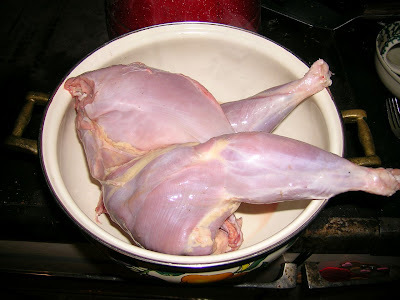 Seeking Chicken Salvage Recipes- Crunchy, or Not. I have a dead chicken. Not- as a consequence of the dog. When I went out to turn the birds loose for the day (they're closed in the coop at night, totally free all day) - the coop looked fine; all the birds were inside, including the little banty hen who is a slippery as a weasel- and one of the Buff Orpington roosters was - dead. 99.99% probability - he was murdered by the other, single remaining, Orp rooster. Now I'm wondering if the disappearance of the 3rd Orp rooster, last week, was not due to the eagles hanging around- but to rooster harassment. Sigh. Well, vast relief it's not the dog; who is still behaving beautifully. And I can feel the relief from the hens, who were definitely over-exercised. The carcass is not ripped up, or anything, but the corpse was cold when I got there. The bird is 9 months old. But was harassed- and left to lie undrawn for quite some time. And, surprise, the other birds in the coop wound up walking over it, and pooping a little on it. Can I pluck it, or should I skin it? (Of course I intend to eat him!) Is he going to taste a little rank? From being kicked around and undrawn so long? Any experience in chicken salvaging out there? I'm leaning toward a pot-pie, at the moment. This will be the first bird we've eaten out of our experiment. Most of the muscle mass will be from commercial feed; but they've been truly free range since they were 7 weeks old. They ate, to my astonishment, a lot of apples; mostly Roxbury Russet (the coop is under one) and Golden Russet, which is the next line in the orchard. For a month and a half setting the birds loose for the day included stepping on and crushing about a dozen groundfall apples for them- which they would attack immediately. Could be interesting. oh, yeah, and the computer is restored. And, of course, Beelar, who has been Sys Admin for his grad school engineering department, tells me "huh, I've never known one to do that before..." - which is standard operating around here. Whatever we break- no one has never broken it that way, before. I could give you a list. I'm using Harry Potter style puppy Latin there. I'm typing this on our 2nd backup computer; waiting for Beelar to herd me through the hoops on restoring and reformatting my nice new MacBook, which refused to boot for me today. Diagnostics say "bad node. - reformat disc." Hate when that happens. Won't lose any data; just time; and am trying to figure out WHY the disc got corrupted. I'm fearing a virus. The backups are clean, anyway. On the Chickenus front- the Dominique is back with the flock; and we've decided it really is a hen. Two factors; we had it IN the Little House for 48 hours, doing rest and recuperation; and once in that time, it went through the "cut-cut-ka-DAWWWcut" routine- which is supposed to accompany egg laying (no egg, alas) - and is really not a vocalization you expect from a rooster. And- once restored to the flock- the two Buff Orp roosters really started showing their opinion that this is a hen. Lots of chasing and treading. Which might, in fact, be what the chicken was doing so far away- the Orps are really agressive and persistent- and I can see the Dominique possibly running so far off that she got lost. Maybe. The good side- even though she was undoubtedly in the dogs mouth- she's really totally undamaged at this point. Though not enthusiastic about the dog being nearby. Thanks- all you guys who chimed in with real world experience. I learned a bunch of useful stuff! Like that Dominique hens can show spur stubs. Alas- this is not a post about our friend Madame Crunchus Chickenus, and her various frisk-risky activities, but about a real chicken. It's still very much winter here, and it's cold out in the makeshift chicken tent we resorted to to get the chickens and guineas (we still have 15, RC! pictures coming! someday!) through the winter. After our ex-dog got through murdering most of the chickens, we were left with 5. Now down to 4- one of the Buff Orpington roosters vanished last week- at the same time we had a pair of bald eagles hanging around. The point to the chickens was supposed to be mostly to provide good foster parenting for the guineas, which we have hopes of turning into a well integrated part of the farm- bug control, watchdog duty, with eggs and some meat. If all goes well. And the Dominique is in the hospital (the house). Exactly how it happened is not clear, but yesterday, responding to weird alarm cries from the woods, I found the chicken being tumbled about by - the dog. Far away from the chicken coop. Oh, not a happy camper here. We've been working pretty hard on training this dog to not hassle the birds- and it really seemed to be working. Putting the muzzle on, any time any agressive move appeared. Delilah really seemed to be getting it. The problem is- it's not clear what happened. Even though 100 yards away from normal range- the bird appears essentially unharmed, though it was pretty shocky when I picked it up. But- no dog tooth punctures, anywhere; not even any visible bruising. And after spending the night inside the house, in a covered box, the bird is calm, looks well groomed, and seems- fine. It's not that I'm really at a loss for what to do. We have lots of options- the problem is, they all take lots of time and attention, and it bloody ain't convenient. It's really irritating, sometimes, how inconvenient life can be. I mean, really. Now we have to work. With the dog. With the chicken. With the family. ah, well. beats spending time reading headlines, I suppose. What the hay, we might as well get a chuckle or two as the Alpaca lips nibble on us. The video ends in that fashion, I'm sure, because the camera person was overwhelmed and eaten by the alpacas at that point. Our friends in the UK have the right idea. They're abandoning the British pound (which is in trouble) and printing their own money. By golly if the gummint can do it, so can we. And, by way of improvement- whose face are they going to put on the money? How about - Benny Hill? Yesterday much ado was generated by Thomas Friedman; the NYT econ-astrology (trying that out, feonix; thanx...) columnist. Friedman has gotten lots of attention in the past year or so by advocating that we can, basically "grow" our way out of our economic maelstrom by investing in "green" technologies. He's even written a book about it, the title of which is sometimes parodied as "Flat, Overheated, and Vacuous". Some of his first toutings were in the NYT, and I responded to what was being called "muscular green" way back then, in some detail. We can’t do this anymore"
"We must have growth, but we must grow in a different way. ... Let’s grow by creating flows rather than plundering more stocks." Semantics should not be the problem here- to an econ-astrologer, "growth" means- my factory will get bigger each year- forever. More employees. More profits. More customers. Friedman is playing with changing that definition; but I don't think he's managed, really. I'm just not buying what he's selling. Crank that I am. So; today- he's got another column out. Announcing to the world that, officially! - we have a real, serious problem with the economy. "This is not a test. This is not a test." He says. Yay! He noticed. That's good. Alas... and hooray... he goes on to illustrate that my Parable Of The Poor Plumber has broad applicability. "All this will require leadership of the highest order — bold decisions, persistence and persuasion. There is a huge amount of money on the sidelines eager to bet again on America. But right now, there is too much uncertainty; no one knows what will be the new rules governing investments in our biggest financial institutions. If President Obama can produce and sell that plan, private investors, big and small, will give us a stimulus like you’ve never seen. Which is why I wake up every morning hoping to read this story: 'President Obama announced today that he had invited the country’s 20 leading bankers, 20 leading industrialists, 20 top market economists and the Democratic and Republican leaders in the House and Senate to join him and his team at Camp David. ‘We will not come down from the mountain until we have forged a common, transparent strategy for getting us out of this banking crisis,’ the president said, as he boarded his helicopter.' "
Are we all rolling on the floor in helpless laughter? Um. Aren't these exactly the same plumbers that busted the sink in the first place- and have had no idea how to fix it? Way to think outside the box!! Sorry, Charlie; we need tuna that - isn't rotten? Knee-jerks are just not going to get us out of this whirlpool. Not to mention Friedman apparently hasn't heard of that (apocryphal) study by the Rand Corporation on the most effective size of committees. So now you have a good decision making body of at least - 80 Leading! individuals. Who are not coming down off the mountain until they have it ALL figured out. Hm. On second thought. Maybe that's a good idea. We could put all those Leading! people up there- and never have to listen to them again. They ain't never coming down. According to the story. After years of acquiring data. Data analysis. Theorizing. Etc. The Rand Corporation put together a well-tested equation, for the optimum function of a "committee". Optimum number of members in a committee for best decision making? "Less than one." Says so, right on the graph. oh, yeah, and CitiBank was up- another 9¢ today! I'm thinking about painting the gallows in polka-dots. LOL!! Huge day on Wall Street! And the headlines go wild!! CitiBank was up a total of....... 40 CENTS!! All the way from a buck-five to a buck-fortyfive!! Forty - pennies. All our troubles are over; after that overwhelming vote of confidence by investors!! 40¢!!!!!!!! Never realized gallows humor could get so hilarious. Sorry to be gone so long. It's kind of "all of the above", when I look in my box of excuses. At the top of the list though is: ok, so what is there to say about all this? The world seems almost jabbered out, to me. It's been said, screamed, whimpered. We're all just waiting for the rest of the shoes to fall on our heads. So it's kinda hard to get up the energy (in between emptying trash cans full of used tissues) to try to write something that anyone in their right mind would want to read. Hey, I'll cheer up next week, probably. Meanwhile; this bit in the Washington Post just hit me, and triggered this story; which might, in fact, be interesting and useful to you. Basically one of the Post's financial pundits is touting a book- by a writer from the Wall Street Journal!! entitled: "The Wall Street Journal Guide to the End of Wall Street as We Know It: What You Need to Know About the Greatest Financial Crisis of Our Time -- And How to Survive It". And she starts out "He had me at the title..."
OMG. Yeah, he had me, too, but in the other direction. Here is why- and this is something we desperately need to get our lawmakers to hear- and act on. True story. A couple weeks ago, I was at a big statewide "green" meeting. It was pretty good. About 400 earnest people; all ages, many of them actually knowing what they were talking about. At the end of it, there was an unusually good "wrap-up" session, with 2 State Senators, one normal, and one I was actually very impressed with, 2 national congressional staffers, and the moderator, who is a state National Public Radio personality. Reasonably intelligent conversation- particularly from the little round Santa Claus Senator, who was smart smart smart. But talked slow. And he said stuff that challenged a lot of common "wisdom". Towards the end, the NPR moderator posed her own question; "Senators, last week I had three economists on my morning show, and I asked them for their views on how long this recession will last, and... " blah blah. My brain switched off right there, and I composed this little parable. Which I actually put to the NPR person, personally, after it was all over. Cornered her, so she couldn't get away. The Parable Of The Poor Plumber. Your sink is leaking, down underneath. You've tackled it briefly with your own pump pliers, but they don't do any good. Time for some expert help. You go to the Yellow Pages, look up "Plumbers", and pick one who is nearby, and available. They send a guy; he works at the sink for a half hour; making lots of show; lots of tools. And he presents you with a bill "Hey, lady, it's a minimum $250 to bring the truck out, ya know; I don't set the prices." The sink seems to work. Except - the next day, the leak is back. Worse than before. You are not happy. You call the plumbing company; and actually have the gall to complain, and basically demand that for $250 bucks, you do deserve a sink that does not leak. They grumble, but send a guy out. Same guy. He's not really fazed by all this- "Lady, sometimes they just take more fixing. I'll get it." And he puts in 45 minutes this time; many tools. A little cussing. Well after supper "There, lady- she's fixed." And he vanishes. The sink, however- still leaks. And actually - the cold water faucet no longer delivers water- and it did, before he got down in there to fix it. If you've been through an exchange like this (and who hasn't) by now, you can see the steam starting to come out of "Lady's" ears. Once more, you chew out the plumber's dispatcher. Once more they send a guy (a different one this time!). Yeah, it's still not fixed. Leaks as badly as ever; and no cold water. We're past the steam coming out of the ears now. Do you call the same plumber to come and fix your problems? Boy, I guarantee I don't. And at this point, the NPR personality (whom I'd forced to listen, tête-à-tête, to this shaggy dog story) said forcefully and abruptly, "Yes. So?" And I replied: "Why. On God's Green Earth. Would you ask an economist anything- about the current economic crisis?" I let that sink in for about 2 seconds (a long time in her world) and continued: "They PUT us here. They say they couldn't see it coming. They don't agree on why or how it happened, and they have no ideas for how to get out of it, or where to go. WHY would you be asking them for advice - as if they had advice to give?" Oh, she didn't buy it. Nope, in her world, economists are who you ask about the economy. Never mind that, just like in the fairy tale (ok, it's Andersen, not Grimm) - they've just proven to the entire world that they are intellectually bare stark naked. A big part of this problem, of course, is that economists have steadily worked to make the world believe they know what they're doing. They invented their own Nobel award (Nobel did NOT give a prize in economics); and added "mathematical modeling" to their discipline. And it all clearly does not reflect any realities- but they've left the world with the impression that there is no other source of information on this important subject; you must ask an economics professor, if you wish to discuss it. No other options exist. That, without thinking, is where the NPR person was. Except. There IS another discipline- which did see "all this" coming; long ago; and said so, loudly. Maybe- it would be a good idea to look to the people who predicted all this; for some understanding, and maybe some answers? Who? Ecologists. I got news for ya- ecology is far more a science than economics- and- you notice they have the same Greek root? oikos - for house. Ecologists actually study the same thing economists do- the flow of resources; over time. Except; ecologists go out into the real world, and look to see how it actually works. Economists- live on college campuses, and make up anything they want. Reality need not intrude. Ecologists do experiments, and measure results. Economists - can't. So they just project. Leaving them open to little booboos like "see, the sun comes up in the east; and goes down in the west- OBVIOUSLY - the sun revolves around the earth." So, Dear World. Your toilet is backed up; not working. Who you gonna call? Update, Tuesday: gosh, couldn't ask for better confirmation of the parable here. Todays "Economix" blog in the NYT is by a Harvard Economics Professor!! - (my little heart is going pitty-pat!) and entitled "The Lorax Was Wrong" - He says living in cities is greener than living in forests. Gosh. If you're interested, the responses in his blog comments hit pretty much every refutation you can think of. I'm tempted to write an OpEd for the NYT myself; maybe entitled "The Professor Is Full Of It." lol. And would they print it? No.